Building a job listing website has its perks but it will not be without challenges. The first real challenge is to find a great theme that will improve and raise the overall performance and style of your website. In this article you will find the best hand-picked WordPress job board themes so you can find the perfect theme and focus on something else. If you choose one of these themes you will have a clear advantage over your competition and can invest your money in advertisement so you can grow in popularity as well. Keep in mind that all these themes are premium WordPress job board themes and are specifically built for job related websites. They come with impressive tools and features that will assist in listing jobs, creating profiles for companies and users, submitting resumes, receiving job alerts, bookmark jobs, and so on. Do not rush in and take your time before choosing a theme as they all have unique features that may be useful for certain purposes. 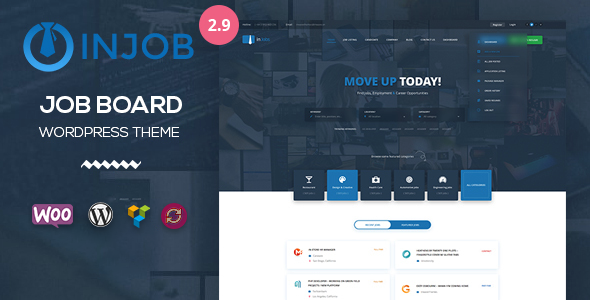 Jobmonster is a wonderfully designed and versatile WordPress job board theme. These professional developers found a way to create a truly unique theme that will offer users a one of a kind experience. 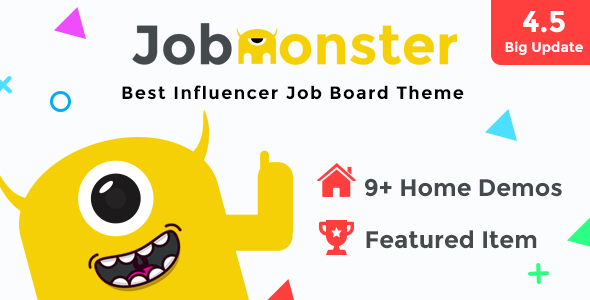 Jobmonster has premium plugins integrated, WooCommerce, payment gateways, homepage demos, job board pages, layout variations, job listings, resume details, an intuitive dashboard, job and resume submissions, and advanced filters and search forms. With Jobmonster you are not required to have programming knowledge because of its extensive and easy to use theme panel. This is without question one of the best WordPress job board themes. 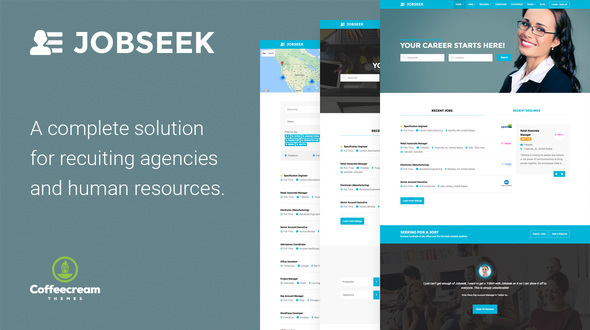 Jobseek is one of the most stylish and modern WordPress job board themes that can be found on ThemeForest. It can and will adapt to all sorts of niches, but is the best for jobs related websites. If you want to take advanced of this theme and all its features you do not need to know how to code to achieve this. Jobseek is highly customizable and fully flexible. Jobseek puts at your fingertips features such as filterable job info, forms for job submissions, job listings, WooCommerce integration, manager for resumes, bookmarks, job alerts, deadlines, job tags, and so much more. You will keep your job listings fresh and interesting with Jobseek at your side! WorkScout is one of those themes that give their all to the user in order to help create professional and contemporary websites. This is a very well documented theme that also comes with a dedicated support team that is always ready to assist. WorkScout comes with an integrated WP Job Manager that will make it way easier to for recruiters and employment agencies. It also comes with Google maps, jobs page, resume page, form to apply for a job, and lots more. 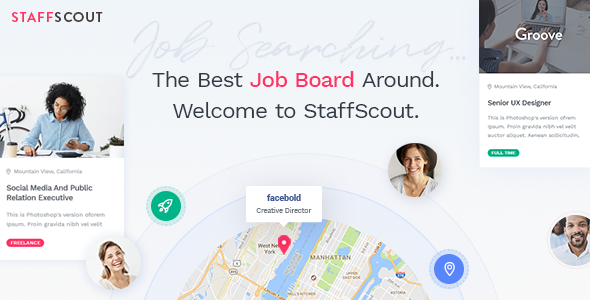 Give WorkScout a try and start your own job board website. 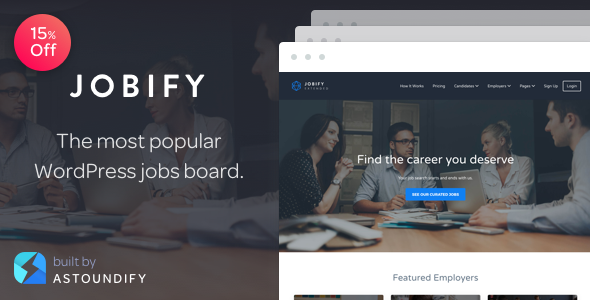 Jobify is a cool, stylish, eye-pleasing, and attractive WordPress job board theme that will catch the attention of your visitors. 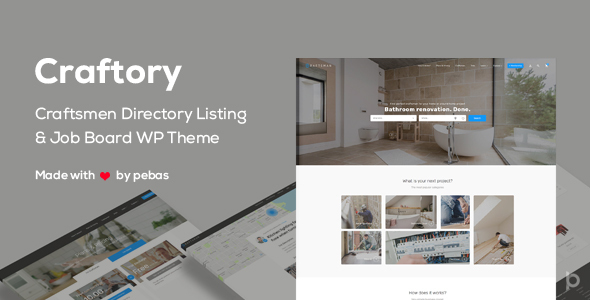 More and more businesses are using WordPress themes for their websites to make the whole process easier, and Jobify is a great theme to use if you are looking for something intuitive and user-friendly. Jobify includes reCaptcha support, job manager, coming soon templates, page templates, search features, location filtering, drag and drop builder, unique forms, and an extensive documentation. Not to mention that you can easily change the typography and color scheme to match it with your business design. Jobify will help impress your audience! 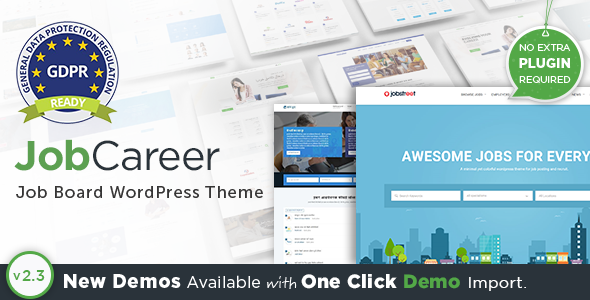 JobCareer is a stunning, powerful, creative, impressive, and responsive WordPress job board theme. It was designed and crafted to be used as a premium platform for job portals, recruitment offices, human resources, and job listings websites. To fulfill its purpose, JobCareer comes with a one click demo import installation, stylish demo templates, drag and drop builder, video uploads, job alerts, location search, featured job slots, candidate subscription, application deadline, profiles, social app integration, CV manager, and many more features. JobCareer will offer you professional solutions for this niche and bring more value to your website. Looking of a theme that packs a punch? 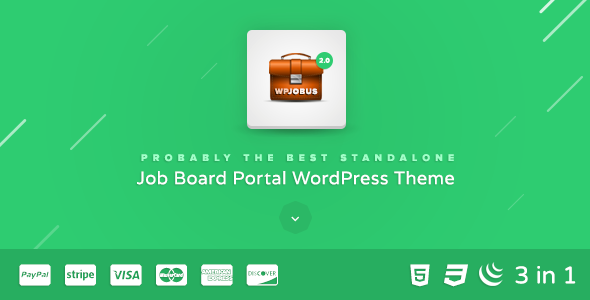 WPJobus is probably the best choice as far as WordPress job board themes go. This theme is highly responsive and adapts beautifully to any small or large device. WPJobus is constantly upgraded and some of the new features added are separate accounts for employees and candidates, option to add to favorite, compatibility with Gravity forms and Ninja forms, and other minor bug fixes. It is a 3 in 1 theme that can be used for job boards, personal resumes, and companies’ profile. If you are ready to draw all the attention to your business try out WPJobus today! 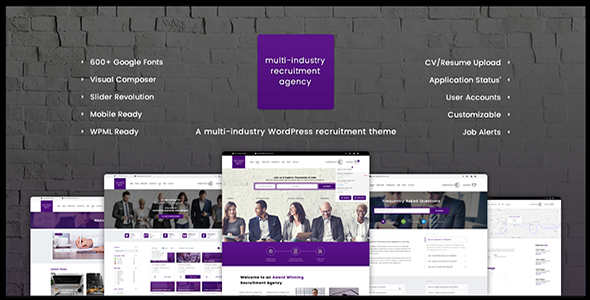 Recruitment agency is a solid, gorgeous, responsive, and unique WordPress job board theme. This crafty platform will turn the tide in your favor and keep your business on the top. It comes with tons of features some of which are 600+ fonts, Visual Composer, Slider revolution, translation ready, CV manager, companies listing page, companies profiles, candidates listing and profile pages, job search form, online application, and application status. With all these features you can create a modern and useful website for people looking for job opportunities. Give it a go! 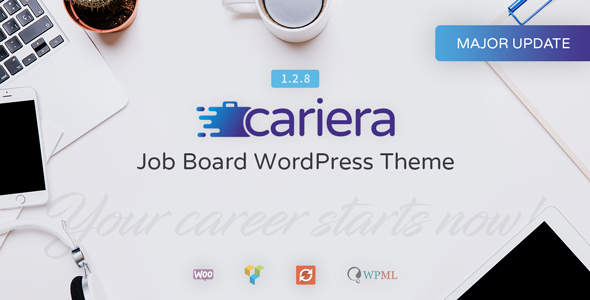 Cariera is a dazzling, sophisticated, eye-catching, fluid, user-friendly, and tech-savvy WordPress job board theme. Cariera offers webmasters the same treatment and is just as easy to use no matter your previous background in web development. It has an impressive number of options and tools such as a job extender, auto location, one click demo importer, homepage layouts, reCaptcha support, and front end submissions. Each element is fully responsive and adaptable to mobile devices and popular browsers. This is a theme you should miss out on! Step up your game with this amazing and attention grabbing WordPress job board theme. InJob is a completely responsive premium theme that was developed specifically to adapt to job listing websites. InJob comes with integrated with one of the best job searching engine, lots of templates, suggestions, WooCommerce, payment systems, management dashboard, review application, email notifications, social networks, profiles, CV and letter templates, map, admin review, and job alerts. All these features are at your disposal through the admin panel. If you want to personalize it more you can do that through typography, color, and layouts options. Step it up with InJob! Jobera is more than just another addition on our WordPress job board themes list. Jobera is a premium quality theme that will go above and beyond to please its user. No matter the country you’re in, you can use Jobera without issues because it is WPML compatible and translation ready. In addition to that, you can easily change its color scheme, homepage layout, slider layout, typography, and page design. You can avoid coding thanks to its powerful and user friendly admin panel where all its features can be found. If you are having troubles with it you can go through its well written documentation to learn more or drop a line to their support team. Go for this incredible theme! While this theme might look like it has been developed for a certain category, it is still one of the best WordPress job board themes you can get your hands on. Pet Sitter can be customized to your heart’s desire due to the powerful Redux theme options panel. It also comes bundled with Visual Composer to help you craft and design gorgeous pages. Some more features this theme has are various grid layouts, job manager, unlimited colors, documentation, Google fonts, reviewer plugin, and a one click demo installer. Allow your imagination to run wild with Pet Sitter! 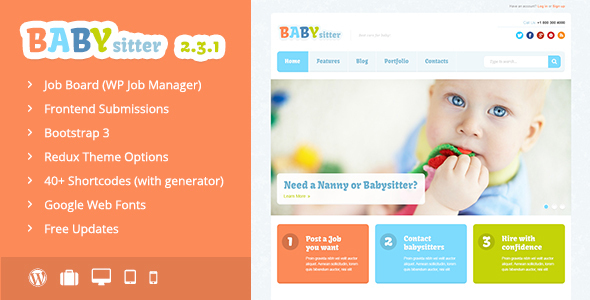 Babysitter is a colorful, fun, enjoyable, but still classy looking theme. It is the ideal choice for baby-sitting job listings because of its easy to navigate layout and pastel colors. Even if the name pretty much says it all, Babysitter can be a great choice for any type of jobs related website. The features this theme has includes a job board, over 40 shortcodes, more than 500 fonts, unlimited color schemes, font awesome, sample data, job listing preview, member’s profile, contact form, and more job related capabilities. Feel free to take a look at the live preview to see how much more Babysitter has to offer. Careerfy is a lovely, neat, clean, and modern WordPress job board theme. Its overall design can match any business’ style and improve it. 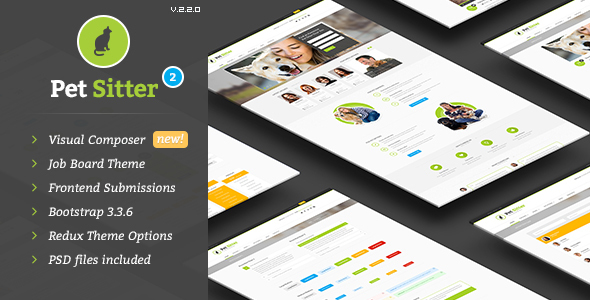 Careerfy is a new theme and already has exceeded all expectations and became a trending item. Every single aspect of Careerfy was carefully designed and developed to be user-friendly and useful. It comes with tools like Google AdSense, job attachments, video uploads, unique demos, job search, application tracking, front-end submissions, ability to import indeed jobs, profile creator, integration with WooCommerce, social media integration, and paid and free job listings. You cannot go wrong with Careerfy! Craftory is a versatile, innovative, special, cool, pristine, and highly-customizable theme that will rise to any occasion. Craftory is well support by a knowledgeable tech team, well documented, and has a detailed changelog. It has an intelligent Ajax search, geolocation, homepage video, 30 templates, over 50 design elements, Google AdSense, payment methods, smart ad spots, memberships, job profiles, review system, and RTL support. There is nothing this theme does cover and all of your needs will be met using Craftory. Make some money online with Craftory! There is no end to that you can accomplish with powerful WordPress job board themes, and Handyman is the perfect example for that. 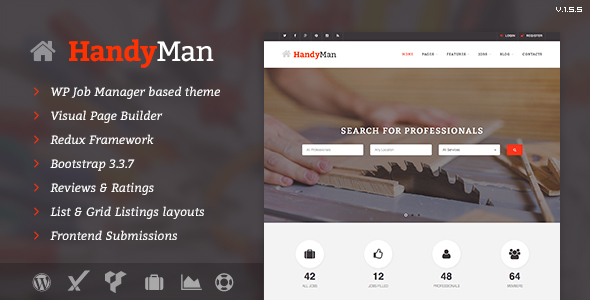 Handyman is a WP job board manager based theme and includes Visual Composer page builder, reviews and ratings system, frontend submissions, different listing layouts, typography options, color schemes, 4 homepage layouts, footer widgets, custom icons, free updates, and the demo content. It is the ideal theme to showcase your job listings to your audience. All the resumes and submissions will be handled with care and organized meticulously. Check out Handyman today! 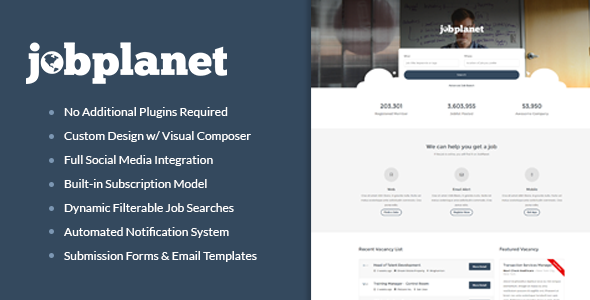 Jobplanet is a WordPress job board theme suitable for human resources management, employment agencies, or other websites that showcase job listings. This kind of job board themes can be overbearing with too many featured, but Jobplanet does a great job of keeping it simple and to the point. In this theme you will find submission forms, email templates, advanced search form, ecommerce shop integration, status messages, full demo data, social login, job vacancies alert, so much more. This theme was developed to serve as an intuitive platform for job listing websites and it does its part perfectly. Enjoy Jobplanet! JobInn was built by CrunchPress which is a Power elite author on ThemeForest. As you might have already guessed, they specialize in themes development, which is why I can say without second thoughts that JobInn is one of the greatest WordPress job board themes. While JobInn is elegant, it is also robust and has many features among which are stunning pre-built homepages, job manager plugin, resume manager, job listings, job vacancies, various premium plugins, mail newsletters, testimonials, galleries, blog templates, header styles, and awesome support. All these features combined create a powerful theme that will adapt to any business. Nine to Five fits perfectly among responsive, fancy, glamorous, professional, and clever WordPress job board themes. Nine to Five will cover all your needs and help you create a one of a kind website for job management. This theme is speed and SEO optimized and it contains options like live filtering, PayPal integration, resume uploader, Google map, autocomplete search, unlimited translations, color schemes, and skins. Nine to Five is simple and intuitive, but if you find yourself lost in all its features you can reach out to their support team and they will offer assistance asap. Try it out today and you will not regret it! 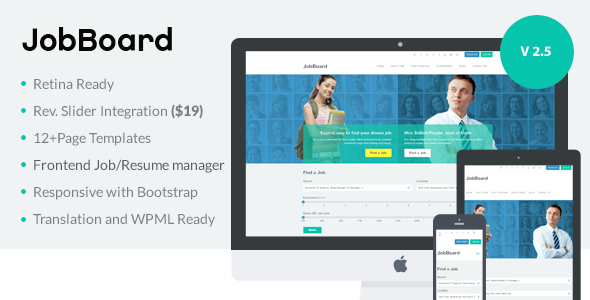 JobBoard is a top notch WordPress perfectly suitable for job boards and job listings websites. JobBoard comes with all the necessary tools to help you attract more visitors to your business. This incredible theme comes with the demo content included, Slider revolution, user registration and front-end loader, jobs and CVs packages, bookmarks manager, WPML compatibility, and a powerful theme panel. If you use JobBoard you will not have any responsiveness or browser compatibility issues. In addition to this, JobBoard is retina ready for high resolution devices. When it comes to professionalism and creativity this is among the best WordPress job board themes. StaffScout can adapt to and improve any business and website. 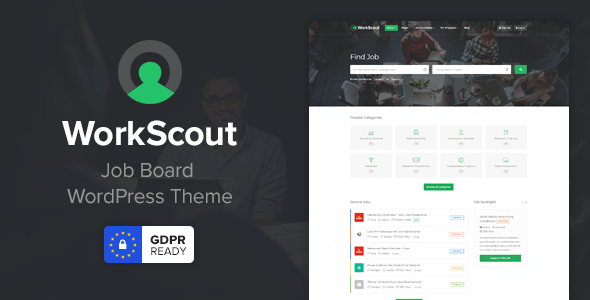 StaffScout comes with beautiful listings, single positions, submissions, one click demo importer, intuitive shortcodes, stunning templates, icon sets, widgets, footer styles, and custom post formats. No matter you expectations, StaffScout will exceed them. Try it out now! Were you satisfied with our choices for the best WordPress job board themes? Did you find one that will meet your needs? Let us know in the comment section below.